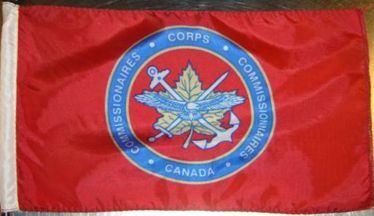 The above image is of the Commissionaires Canada flag. The following description of this organization comes from their website. Commissionaires Canada is not an agency of the federal or provincial governments. We are a private, self-supporting, not-for-profit organization, continuing a proud tradition that started more than a century and a half ago. By operating in this manner, we are able to fulfill our original mandate of providing fair and meaningful work to ex-military personnel while providing our clients with quality service at competitive rates.